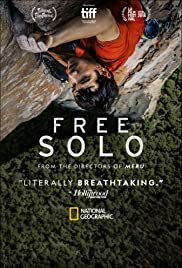 FREE SOLO is the new documentary by Chai Vasarhelyi and Jimmy Chin who wowed audiences years back with the other mountain climbing 2015 doc MERU that chronicled the first ascent of the “Shark’s Fin” route on Meru Peak in the Indian Himalayas. Chin is himself a mountain climber who has climbed with the subject, Alex Honnold. Chin is also a close friend of Alex. To appreciate FREE SOLO the documentary, one must understand the sport of free soloing. Free solo climbing, also known as Soloing, is a form of free climbing and solo climbing where the climber (or free soloist) performs alone and without using any ropes, harnesses or other protective equipment, relying entirely on his or her ability instead. Soloists typically climb above safe heights, where a fall would always result in serious injury or death. In ordinary free climbing, safety gear is used to protect from falls, although not to assist the ascent. FREE SOLO the doc offers an unflinching portrait of 31-year Alex Honnold as he prepares to fulfill his long-time dream to climb the face of Yosemite’s El Capitan – 3,200 feet of sheer granite – without a rope. Less than 1% of those who climb attempt free solo. 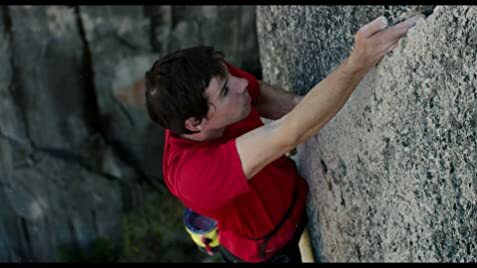 The film explores his psyche and relationships, with interviews from Honnold, his mother, his girlfriend and fellow climbers. The film be best seen on the big screen due to the majestic landscape of rock, mountains and natural vegetation. I, unfortunately viewed the film on a streaming link, but better to have seen it this way than not at all. Not every person can be a free solo climber but watching this doc on the big screen offers audiences the opportunity to experience the thrill the subject Alex Honnold goes through. The director of photography credits go to Mikey Schaefer with Chin and Clair Popkin. A funny segment of the doc (providing the audience with a break) involves Alex doing an MRI of his brain. It is determined that he needs more stimuli than most to get himself excited. Alex is extremely fit and has a muscled wiry physique, though is is clear he has a bit of a posture problem, which could be due to a past injury. To make the film more human, the directors devote some screen time to Alex’s family background. His mother is a French teacher and Alex never knew how to hug or use the word love as a kid. Alex also speak candidly on screen as to what motivates him and to the reasons of his choice of the sport. The film examines the relationship between Alex and his new girlfriend, she obviously deterring him from giving 100% to the sport. And the final portion of the movie is the filming of the climb on El Capitan. FREE SOLO gives a new meaning to the term edge-of-your-seat suspense. The film won won the People’s Choice Award (Documentary) at TIFF 2018.